The latest Spring 18 collection from Punk Rave has arrived including Goth, Punk and Grunge styles for girls and guys including shorts, dresses, outerwear and these must-have tops. This Punk Rave Tank Girl Top is a postapocalyptic fitted waistcoat with zip front and skeleton hand charm. The alternative top has a vegan leather trim and buckled belt front. It also features a detachable arm pocket. This Punk Rave Gothic Disco Top is a punk cropped vest. The alternative top has a high neck with eyelet studs and silver barbell detail. The top has vegan leather trimmed sleeves with eyelet studs and a zip fastening back. Finally, this Punk Rave Sinnea Bra Top is a sassy little bralet. 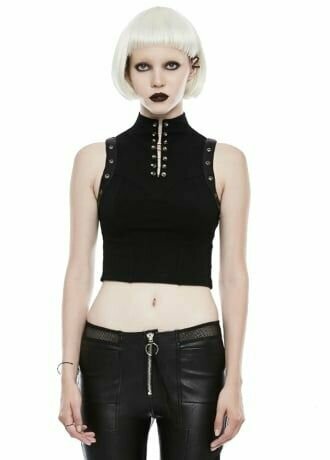 This Gothic cropped top has a laced front and zip back and features a crossback waist strap. Shop all the latest new season styles by Punk Rave now.